Whether you're a newbie or a long-term resident of one of our Springs luxury apartment communities, hosting a get-together is a perfect way to create and nurture relationships with your neighbors. Here are some tips for throwing a fabulous party without breaking a sweat. Creating a Facebook event is an easy and convenient way to get the word out. You can include all the details along with notes about themes and other necessary information, and guests can RSVP with a simple mouse click. Worried about having enough space? There's no rule that says the festivities have to be confined to the living room. Place trays of food in the living room, on the kitchen island or breakfast bar, in the bedroom and on the balcony or patio to encourage guests to move about the apartment. Don't worry about scrambling to rent or borrow chairs. Ottomans, cushions and pillows are well-suited to a casual ambiance and they provide the flexibility to move around. Keep the food simple so you're not spending all your time in the kitchen. It will also be easier for your guests if they don't have to struggle with complicated eating arrangements. Snacks and appetizers are convenient for your guests, can be prepared ahead of time and you can offer a wide assortment of items. 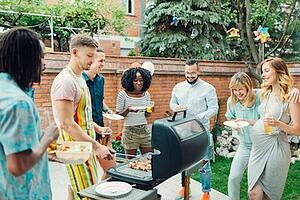 Having a potluck is a great way to get your neighbors involved. Add an extra element of fun by designating a theme, such as desserts or Mexican foods. Music makes a major contribution to creating a festive atmosphere. Have a basic playlist prepared, but use an app like Spotify and let guests cue up their favorite tunes. Have some games and activities planned, but don't feel you have to force the entertainment. If you sense a relaxed vibe and people are engaged, let the party flow naturally. Reverse Charades (free for Android and iOS) adds a twist to the classic game with groups acting out clues for a single person. Party Doodles (free for iPad) is a digital version of Pictionary, where players use drawings instead of words to give clues. Sing! (free for Android and iOS with in-app purchases) turns your apartment into the coolest karaoke bar ever, with special audio and video effects. Share your favorite entertaining tip with us in the comments!